came from Honduras with her family in 1977. She received her Bachelor of Fine Arts degree from Oregon State University in Spanish with a minor in Sociology. Currently she works at the Portland Impact Center as a Latino Advocate, where she is responsible for the recruitment and case management of Latino youths. is an active ensemble member of El Teatro Campesino (ETC). Born and reared in the collective milieu of the famed social justice theater company founded by his father Luis Valdez, Kinan served as ETC’s Producing Artistic Director until 2016, training the newest generation of community artists and activists now leading the fifty-one year-old company. As an individual playwright and director, Kinan explores the intersections between the mundane and the mythic—through original works and adaptations of ancient mythology premised on the collision of diverse performance traditions. More recent directing credits include: Heart of Heaven (2015, Center Theatre Group), La Esquinita USA (2017, Arizona Theater Company) and Zoot Suit (2017, Center Theatre Group). Aside from working in the theater as a playwright and director, Kinan is an award-winning filmmaker, an educator at the University of California Santa Cruz, and a national organizer for the Latinx Theatre Commons. is a director, writer and performing artist. Born and raised in the extended family of El Teatro Campesino, he served as the company’s Associate Artistic Director from the years 2000 to 2005. He is currently the resident playwright/director of E.T.C. and primary deviser and director of headRush in Oakland, CA. Since 2004, Lakin has written, directed and performed in more than a dozen plays, culminating in work that reflects the rich history and vibrant culture of the Latino/Chicano community. His body of work has been described as “powerful” (L.A. Times), “consummately engaging” (Variety), to “hauntingly intense” (San Francisco Chronicle). He is the recipient of two NPN Creation Fund Awards, a Zellerbach Emerging Playwright Award and an NEA Access to Excellence Award for his generative work. whether in the migrant labor fields or on Broadway, remains true to his original vision: performance that addresses the Chicano experience in America in a context meaningful to all Americans. Valdez’s credits include founder & artistic director of the internationally renowned El Teatro Campesino, council member of the National Endowment of the Arts, and founding member of the California Arts Council. His awards include, Presidential Medal of the Arts, the prestigious Aguila Azteca Award, Governors Award of the California Arts Council. Best known works: Zoot Suit, La Bamba, and Corridos, winner of the George Peabody Award. He continues to work and mentor a new generation of theatre artists at El Teatro Campesino Playhouse. For more information about El Teatro Campesino, visit http://www.elteatrocampesino.com. resides in Vancouver, Washington, where he is a student at Clark College. Originally from orange County, California, Saul acquired his interest in theater at a very early age. Although he has modeled extensively, Saul is now actively pursuing a career in acting. Saul Valdez owns and operates his own successful mortgage services branch in Vancouver, Washington. Vancouver is where he has spent the majority of his life. Over the last 8 years, Saul has thoroughly enjoyed acquiring and managing real estate throughout the West Coast. He loves creating and cultivating real estate investors. Other professional experience includes his time with the Social Security Administration at the District Office in Beaverton from where he was promoted to the Office of Hearings and Appeals in Downtown Portland. There, he worked for several Administrative Law Judges serving as a Bilingual Sr. Legal Assistant. Prior to that, he worked for the State of Oregon Department of Employment where filled the position of Bilingual Business Services and Employment Specialist. Saul is a direct descendant of migrant farm workers of Mexico. As a ‘lesson in life’, Saul spent many of his earlier school year summers working alongside his then-current farm working cousins in eastern Washington. His family never forgets their roots. Currently, his family does everything in their power to assist, educate, and empower new and struggling Latino families of various backgrounds and countries in various departments of life. The other and biggest passion in Saul’s life involves his love for the arts including theatre which he has carried since childhood. Just out of high school, he trained for commercial and film acting with Barbara Balz of BBC Casting. He later studied theatre at Clark College. In the Summer of 1995, he toured with Teatro Milagro as Alfredo in Mi Gente, Mi Vida. who has also studied modern dance and yoga, began dancing tango more than 10 years ago. Her teachers included Gustavo Naveira, Fabián Salas, Mingo Pugliese, Pepito Avellaneda, Graciela González, Mariano "Chicho" Frumboli, among others. From 1995 to 1997 she was part of the prestigious "Tango Investigation" group of Gustavo Naveira and Fabian Salas. The pedagogy and tango style of these two dancers and teachers has been her greater influence. Since 1995, she has taught regular tango classes at the Facultad de Filosofía y Letras de la UBA (part of University of Buenos Aires), Facultad de Ciencias Sociales, Asociación de Abogados de Buenos Aires, Asociación de Trabajadores del Estado and at various Cultural Centers and Tango Halls of Buenos Aires. In 1996 she started to work outside Argentina, teaching tango classes in Brazil, Ecuador, the U.S., Canada and Europe. Since 1998 she has been part of a group of female dancers and teachers dedicated to the research of the tango, co-directing El Motivo Tango, a tango space that includes one of the most prestigious and popular practica in Buenos Aires, plus thematic seminars and regular tango classes. In addition to many national and international tango festivals and Congresses, Luciana has choreographed for Opus Chamber Orchestra, part of Salt Lake City Opera, on its version of Maria de Buenos Aires, from Astor Piazzola. worked for 30 years as a specialized accounting supervisor for PP&L. Upon retirement, she decided to remain active and returned to an early love--the theatre. She received rave reviews for her performance of Sally in The Fifth of July for PCC, Millie in Yours From The heat Of My Heart, and most recently in the IFCC production of If It's raining, This Must Be Portland in which she played five different roles. takes design seriously. And this one was a challenge like no other — unraveling beautiful, skin-tinglingly gritty, and possibly unstageable. The result? A confluence of cosmic events. Enjoy. Recent plays include Alice & Wonderland for Oregon Children’s Theatre, Oedipus for Classic Greek Theatre of Oregon, and Rocket Man for Baseroots Theater. Behind every successful designer there’s someone holding everything together — thank you, Brandon. has been taking acting classes at Portland Civic Theatre for the past three years. She attends Grant High School where she has appeared in PRIME OF MISS JEAN BRODY and DIARY OF ANNE FRANK. Last summer she participated in a month long workshop on Greek drama at PCC and played the chorus leader in their production of OEDIPUS REX. Among the productions she has done at PCT are DAVID AND LISA and an evening of one-acts. This is Ga-lo's debut role in theater. He is a Native of Tahlequah, Oklahoma and is enrolled in the Cherokee Tribe. Since he started volunteering at the Miracle, he has become entranced with the art and the culture of this wonderful place. He is the next generation in a family of actors and hopes to carry on this wonderful tradition. Since childhood, Jani has enjoyed being involved in choir and theatrical productions. Recent favorite roles include playing Reno Sweeney, Golde, Frankie Futrelle and Miss Prism, as well as being in the female ensemble with Light Opera of Portland during the last 3 productions. Playing in this production is a delightful opportunity for her and she thanks the production team, cast and the audience for making it so wonderful, as well as a shout out of eternal gratitude to her husband Juan Jenkins for the support he provides by covering the needs at the adult foster home they own and operate in Woodburn since 2001. Janelle (Jani) VanPelt: desde su niñez, Jani ha disfrutado presentándose en producciones corales y teatrales. Sus papeles recientes favoritos incluyen Reno Sweeney, Golde, Frankie Futrelle y Miss Prism, además de pertenecer al elenco de mujeres con la Light Opera de Portland en sus últimas tres producciones. Actuar en esta producción es una oportunidad genial para ella, y le agradece al equipo de producción, al elenco y al público por hacer esta esperiencia algo maravilloso, además manda una gran expresión de gratitud a su esposo Juan Jenkins por el apoyo que él brinda al cubrir las necesidades del albergue de adultos que los dos manejan en Woodburn desde el 2001.
is originally from Jalisco, Mexico. She moved to the United States in 1992. She works as an AIDS outreach educator at Columbia Center, which givers her great satisfaction, knowing that she is making a difference in the Latino community. She is studying English and is enjoying her first experience with the Miracle Theatre. Previously she has performed as a folkloric dancer in Mexico. is originally from Ecuador, where he managed both his own arts company, Al Mimo Tiempo, as well as performed with several regional theatre groups. He toured his one-man show, Sobreviviendo, throughout Latin America, Mexico and the U.S. Locally; he has shared his talents as an actor and a mime with the Miracle Theatre Group in 14 productions, the tri-county Library Arts-in-Education program and the Regional Arts and Culture Council. As well as performing in the Teatro Milagro touring shows since 2001, Omar has been an artist-educator for PUENTES (Bridges), the Teatro Milagro bilingual literacy program in residence at schools where the company tours. In 2005 he joined the Miracle staff as Community Liaison and now he is the Coordinator of Education and Outreach strengthening relationships with the Latino community and its educational, social service and media organizations. Omar Vargas viene de Ecuador, donde trabajaba con su propia compañía “Al Mimo Tiempo” además de presentarse con varios grupos de la región. Ha viajado con su propio show “Sobreviviendo” por Latinoamérica, México y los EEUU. 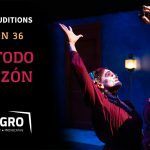 En Portland ha compartido su talento como actor y mimo con el Teatro Milagro en 13 producciones, además de los programas educativos de las bibliotecas de tres condados y el RACC. Aparte de participar en la compañía itinerante de Teatro Milagro desde el 2001, Omar ha sido un artista educador para PUENTES, un programa literario de residencias para escuelas. En el 2005 Omar formó parte del personal del Milagro como Enlace Comunitario y ahora es el Coordinador de Educación y Alcance Comunitario para aumentar los lazos de relación de la compañía con organizaciones latinas comunitarias, de servicio social, artísticas y de prensa del área. studied street theatre in San Francisco with Richard Syde where she worked with the Haight-Ashbury Theatre Group. Previous to coming to Portland, she was involved in Puerto Rican Folkloric groups in both San Francisco and Los Angeles. In Eugene, she also appeared in Mujeres de Oregon Adelante Si. Coming from LA, California Roman Vasquez has had the opportunity to work for artists such as Christina Aguilera, Jennifer Lopez, Jessica Simpson, Celine Dion, BackStreet Boys, Eva Longoria, Roselyn Sanchez, Anastasia, just to name a few. Other television/film and video credits include American Music Awards, MTV Music Awards, Kids Choice Awards , Pepsi, Sprite, EL Pollo Loco, Days of Our Lives, Rock the Reception, Bring it On 5, Indiana Jones 4, Mobbed and Alvin and the Chipmunks 3D. He has also choreographed and performed with companies such as Nike, FUBU, Adidas and Paul Mitchell. Roman Vasquez continues to choreograph and teach across the country on workshops and dance conventions. is excited to be making his debut here at Milagro. He graduated from Portland State University with a B. S. in Theatre Arts and was most recently seen in Sleepy Hollow (Beaverton Civic Theatre). A late joiner to the world of theatre, Ricardo finds himself acting in scripted and improvised work whenever he can. Some of Ricardo’s favorite roles have included Cassio in Othello, Frank in Fen, and Jesus in The Last days of Judas Iscariot. He would also like to thank his favorite collaborator and beautiful wife Robyn, whose patience, love, and support enable him to chase his dreams. has had both an interest and flare for the dramatic arts since High School. Her first two years of College were attained through a scholarship in dramatic arts. She continued her interest in thatre by her involvement with the first theatre and Forest theatre both in the Monterey Peninsula area. This is her first stage performance since 1975 when she played Abigail Williams in Arthur Miller's The Crucible at the Forest Theatre in Carmel. This will be her first performance at the Miracle Theatre. is a writer and director living in Los Angeles. His short film, “Crabgrass Manifesto,” was an official selection at the Sundance Film Festival in 2000. Born in Mexico and raised in Oregon, Aldo is the co-author with Patrick Scott of “The True History of Coca-Cola in Mexico,” and “The Good News About Sweatshop Shoes,” both of which were produced at numerous theaters around the country. Currently, he is in the process of raising funds for an independent feature Hollywood film. Julio Cesar Velazquez was born and raised in Mexico City. He was interested in the arts from an early age, participating in many arts activities throughout his childhood. He returned to acting and singing in Los Angeles, performing in works including My Brother Pliny, directed by Ruben Amavizca. Portland credits include El Muerto Vagabudno and Oyé Oyá (Milagro). Julio appreciates the opportunity to have worked alongside his fellow theater artists and the staff of Milagro. Julio César Velásquez, nació en la Ciudad de México, y mostró un interés por las artes a una temprana edad. Sus créditos incluyen: My Brother Plinio de Fernando Castro y coescrita y dirigida por Ruben Amavizca (Frida Khalo Theatre), Las Muñecas de Fernando Castro y Julio Cesar, La Boda escrita y dirigida por Juan Roca. Su primer trabajo como actor en Portland fue sin duda una de las experiencias más satisfactorias para él; fue un regalo trabajar en El Muerto Vagabundo escrita y dirigida por Georgina Escobar. Él le agradece a Milagro por la oportunidad de actuar en su primer musical y espera que hayan más oportunidades en el futuro. is happy to be working at the Miracle Mainstage again after having costumed El Paso Blue, Blood Wedding, Burning Patience, Deporting the Divas and The True History of Coca-Cola in Mexico. Vercouteren is known around town for her costume and prop work with several companies. She is also a co-founder and performer with The Really Big Dance Company. Andrea Vernae is so excited to be performing with Milagro this season. She was last seen in Everybody by Branden Jacob-Jenkins at Artists Rep. When not onstage, Andrea is proud to serve as Managing Director of Confrontation Theatre and creating short films with Sunflower Creations. una diseñadora local para los teatros de Portland. Ha creado diseños para una creciente lista donde constan Miracle Theatre Group, Integrity Productions y Northwest Children’s Theatre Company. Este es su segundo show con el Miracle (realizó el diseño para La Carpa del Ausente en 2007) y está muy orgullosa de ser parte de tan magnífico equipo. Sophya Vidal is a local designer for Portland theatres. She has designed for a growing list including Miracle Theatre Group, Integrity Productions and Northwest Children’s Theatre Company. This is her second show with Miracle (having designed La Carpa del Ausente in 2007) and she is proud to be part of such a great team. is very excited to return to the Miracle Mainstage. She recently played Fortuna in Fortuna del la Vida, a repertory production of Teatro Milagro. A native Oregonian, Linda is a graduate of Oregon State University in Corvallis and is currently employed with Mentor Graphics in Wilsonville. of Acapulco, Mexico began dancing at age six. He has performed with the internationally renowned Ballet Folklorico de Mexico with Amalia Hernandez in Mexico City, Centro Danza Cuernavaca, Ballet Fiesta Mexicana, and many other groups throughout Mexico as well as here in Oregon. Now he combines his love for dance and art with his job at Migrant Head Start in Cornelius. This is Villar's first production with the Milagro Bailadores and the Miracle Theatre Group. is excited to be working on the Miracle stage again after appearing in Fuente Ovejuna and El Día de los Muertos last season. Originally from Montreal, PQ, she graduated with top honors from the Dome professional theatre program. Since moving to Portland, she’s also worked with P.A.E. and Sojourn and presently performs educational theatre for children with C.I.T.E. Much love to those dear to her and thank you to Rebecca for all her encouragement. is a senior at the Metropolitan Learning Center. His favorite class is French and outside interests include playing and listening to music, racquetball, expensive but healthy foods and dining out. Loren plans to attend college following graduation. has an extensive classical music background which began at the USC Preparatory School of Music with the violin at age 6, and then with the piano at age 8. He was a featured soloist with Youth Symphony West under the direction of Robert Armour and was Concertmaster for the Southern CA Honors Orchestra under the direction of Michael Zearott. Arturo continued his passion for music with the guitar and has performed at the Portland Waterfront Blues Festival, Indian Summer Festival in Milwaukee, WI and in New York City for the American Indian College Fund where he sang and played guitar and bass with Native American Music Award winner, Gary Small. Arturo now performs with his duo (sometimes trio) group, Colores del Alma (www.ColoresdelAlma.net). es actor, dramaturgo y director nacido en la Ciudad de México. Es egresado del Centro Universitario de Teatro. Ha actuado en más de 65 puestas en escena de reconocidos directores mexicanos. Ha sido autor y director de sus propias obras de teatro: Un Alacrán (por las que van de arena), Un Pañuelo el Mundo es, En la Quincena, Julio César...; Autocensura, Dicen… y Gallina Vieja. Ha dirigido también El Hombre sin Adjetivos de Mario Cantú Toscano; y Monogamia de Marco Antonio de la Parra. Ha actuado en más de 15 películas profesionales y amateurs. Ha co-dirigido y actuado en diversos espectáculos de improvisación y de stand-up comedy. Ha sido docente en el Centro Universitario de Teatro y en Artes Escénicas Argos. Ha participado con los grupos Utopía Danza-Teatro, Compañía Nacional de Teatro, Teatro de Arena, Grupo Bochinche, Compañía Los Endebles AC, Teatro El Milagro, Colectivo Teatral Seres Comunes, Teatro del Farfullero (co-fundador), Pastegé Stand up Comedy a la Mexicana (co-fundador), Liga Mexicana de Improvisación LIMI (co-fundador), y Búho Grande Teatro (co-fundador y actual Director Artístico). Obtuvo el Premio Nacional de Dramaturgia Joven “Gerardo Mancebo del Castillo” 2002, convocado por el Centro Cultural Helénico, por su obra Un Pañuelo el Mundo es, publicada por Fondo Editorial Tierra Adentro. Para más información: www.juancarlosvives.wordpress.com. Juan Carlos Vives is an actor, playwright and director from México City. He graduated from Centro Universitario de Teatro de la Universidad Nacional Autónoma de México in 1991. Since then, he has distinguished himself by his very intense and versatile activity onstage and backstage in Mexico and abroad. He has acted in more than 65 plays. He has written and directed Un Alacrán (por las que van de arena), Un Pañuelo el Mundo es, En la Quincena, Julio César...; Autocensura, Gallina Vieja and Dicen.... He has directed Mario Cantú Toscano’s El Hombre sin Adjetivos, and Marco Antonio de la Parra’s Monogamia. He has acted in more than 15 experimental and professional films. He has also co-directed and acted in several improv and stand-up comedy shows. He has taught Improv Techniques at the Centro Universitario de Teatro and at Artes Escénicas Argos. He has participated with Utopía Danza-Teatro, Compañía Nacional de Teatro, Teatro de Arena, Grupo Bochinche, Compañía Los Endebles AC, Teatro El Milagro, Colectivo Teatral Seres Comunes, Teatro del Farfullero (co-founder), Pastegé Stand up Comedy a la Mexicana (co-founder), Liga Mexicana de Improvisación (co-founder), and Búho Grande Teatro (co-founder and present artistic director). He has been awarded the Premio Nacional de Dramaturgia Joven “Gerardo Mancebo del Castillo” 2002, convened by the Centro Cultural Helénico, for his play Un Pañuelo el Mundo es, published by the Fondo Editorial Tierra Adentro. For more information: www.juancarlosvives.wordpress.com. spoken-word artist, knows words save lives, poetry has the power to revolutionize, and writing can give your wings. She laughs and lights candles to find ways through these charcoal-dark times. (No more war. Anywhere. Please.) She's been performing her work and leading creative writing/spoken-word workshops since 1995.
is thrilled to be making his Milagro debut in ¡Viva Don Juan! Matt was most recently seen by Portland audiences in the title role of Portland Actors’ Ensemble’s Pericles. He has also appeared in the Fertile Ground Festival, Jewish Theatre Collaborative’s reading series, and the Working Theatre Collective. A native of Washington, DC, Matt has worked with DC’s Shakespeare Theatre Company and Folger Shakespeare Library. is a film maker, teacher, and writer of stage and screen plays. He has recently completed the video feature, Sadako Wishes, and is presently developing the play, Carry On, Dear Blood, for spring production at the Interstate Firehouse Cultural Center. Medea marks his return to acting after a two year absence.